On average, 76,000 deaths were prevented globally every year from 2000-2009 thanks to using nuclear power. A mean of 117,000 deaths per year were prevented alone in Germany between 1971-2009, yet Germany announced plans to shut down all reactors by 2022. 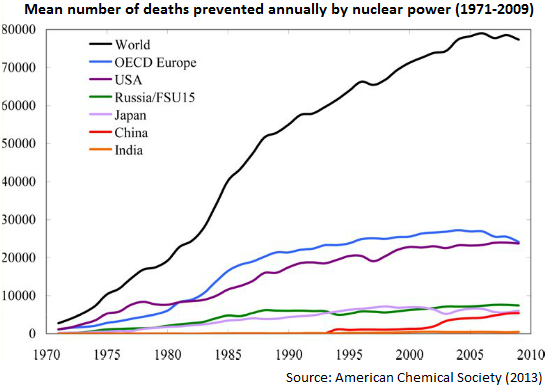 The estimated human deaths caused by nuclear power from 1971-2009 are far lower than the avoided deaths. Globally, some 4,900 such deaths were calculated, or about 370 times lower than the number of avoided deaths. Around 25% of these deaths are due to occupational accidents and about 70% are due to air pollution-related effects.